Perfect for traffic control in residential areas, the J200 HA bollard is easy to transport, store and install. This retractable automatic bollard features a stainless steel satin finish and fast, silent movement. 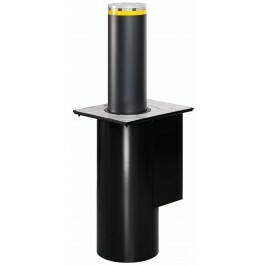 The J200 HA is a hydraulically-automatic retractable access control bollard. Designed and manufactured by FAAC, this bollard is built for the control of traffic in residential areas. For convenience, this bollard is automatically retractable and is operable by authorized personnel or through automatic commands. This model is designed for situations where a fixed bollard is not practical. The J200 model is made from sturdy AISI 316L grade stainless steel and treated with a satin finish.